Jose Mourinho has been charged with misconduct by the Football Association over his language and behaviour in Chelsea's defeat by West Ham United. Mourinho was sent to the stands after going to speak to referee Jon Moss in his room at half-time on Saturday. Both clubs have been charged for failing to control their players and have until 29 October to respond. Chelsea are already facing a £25,000 fine for receiving more than five bookings in the Premier League loss. As well as the two yellow cards given to Nemanja Matic, Chelsea also had Cesar Azpilicueta, Willian, Cesc Fabregas, John Mikel Obi and Diego Costa booked at Upton Park. Mourinho's assistant Silvino Louro was also dismissed during the match and has been charged with misconduct in relation to his behaviour in the technical area. The club is also going to be asked by the Premier League to explain why Mourinho did not take part in the post-match news conference. On Friday, Mourinho warned that his relationship with the media would be changing after phone camera footage of him in west London was published. Mourinho watched most of the second half from the directors' box at Upton Park, but disappeared shortly after Carroll headed home West Ham's winner to make it 2-1, and did not reappear to fulfil his post-match press duties. The Premier League has confirmed that should a club fail to undertake media obligations, the governing body will write to them to obtain their reasons before deciding on any sanction. It added that this can range from a warning to a fine, with each case looked at on its merits. The FA is awaiting referee Moss's report on the game, which is expected to detail why Mourinho was sent off. Mourinho also received a suspended stadium ban this month, imposed for claiming officials were "afraid" to award his team penalties in the aftermath of the 3-1 home defeat by Southampton on 3 October. The defeat was Chelsea's fifth in 10 league games this season and leaves the reigning champions in 15th place with 11 points, 11 behind leaders Manchester City. 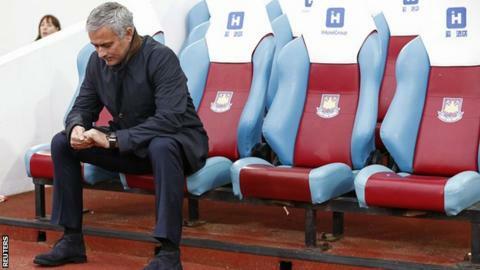 Former Premier League referee Mark Halsey said that Mourinho should apologise after his recent outbursts. "I've known him a long time and he wears his heart on his sleeve," Halsey told BBC Sport. "But sometimes you have to take a step back and think about what you are saying. When you are criticising the referee and his integrity then we can't do that." Former Liverpool and Fulham midfielder Danny Murphy told Match of the Day 2 Extra that Mourinho was "overly paranoid" and "irresponsible". "The players must look at it and think: 'What's he doing? We need him down here'," said Murphy. "If the players see a fighting manager who is saying the right things, getting on with the job, not making excuses and feeling sorry for himself - the players respond. "The only reason they sack him, for me, is if he continues to tarnish the club's name by his behaviour. I think that is the bigger issue."